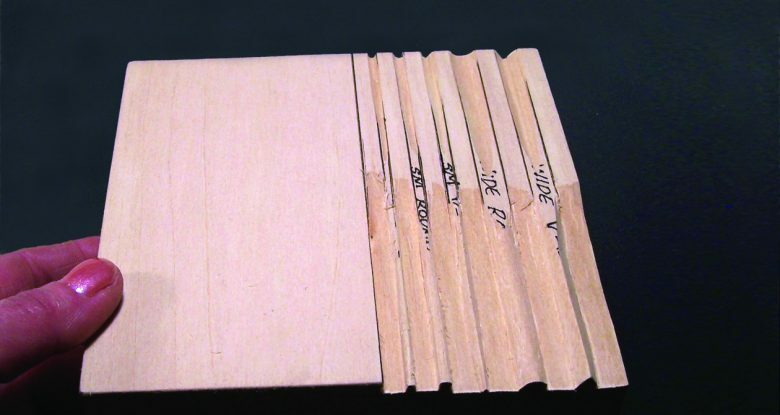 The profiles and reverse profiles of this honing board conform to the cutting angle that you use during carving and match your gouge and V-tool exactly. 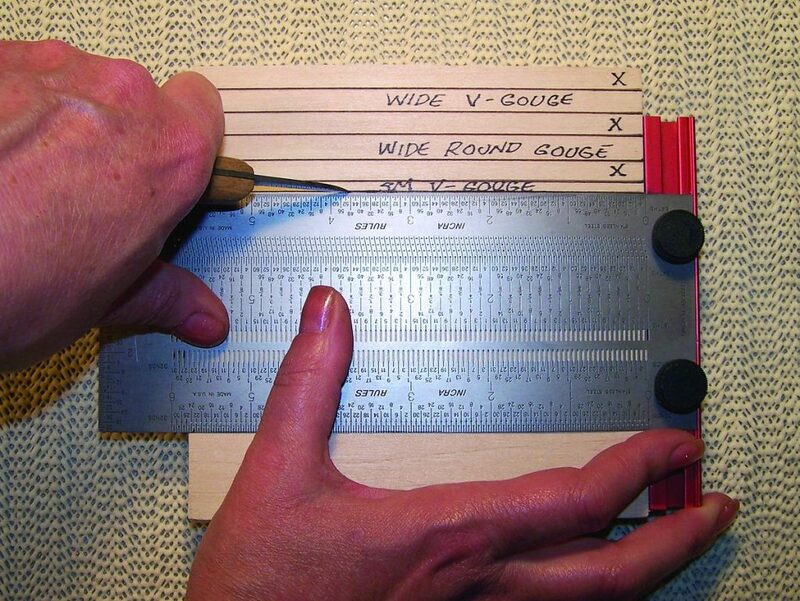 With just a few minutes of work, you can create this honing board customized to sharpen your specific gouges and V-tools. This honing board is small enough to include with your tool kit, yet large enough to allow extra space for new profiles as your tool collection grows. 1. 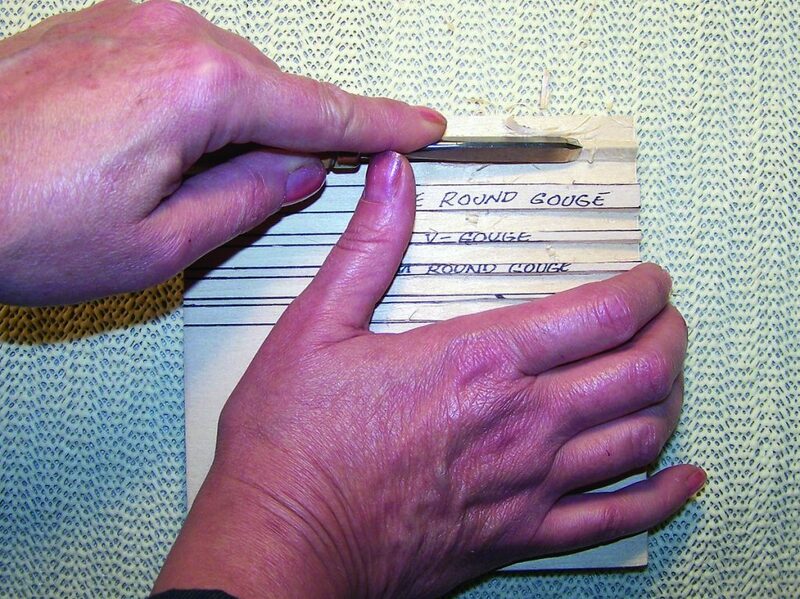 Mark the guidelines for your honing board. 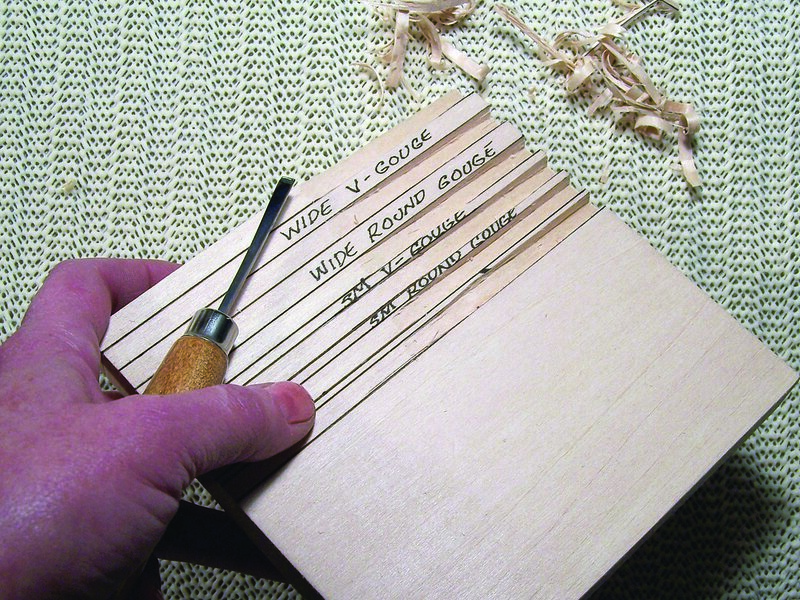 Place each gouge or V-tool face down upon the wood. 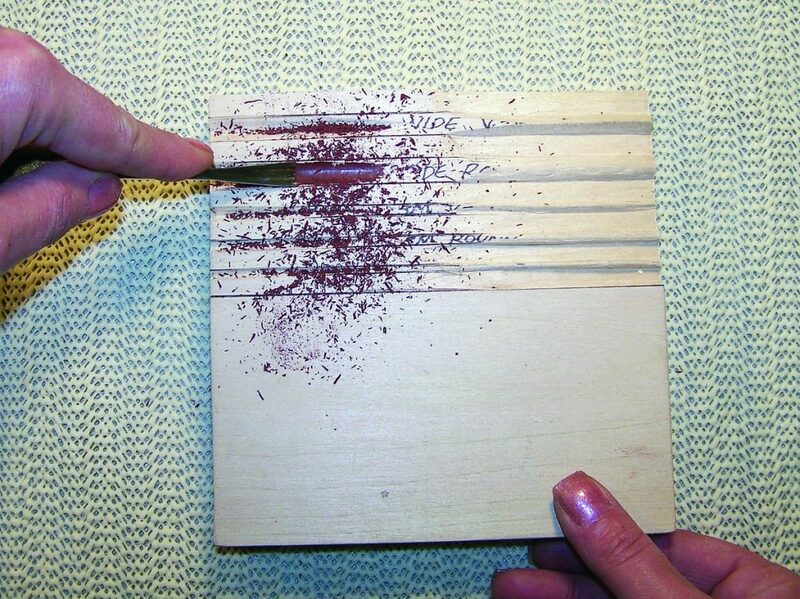 Make a pencil mark at the edge of each tool tip. Allow ¼” space between each tool and along the edge of your board. 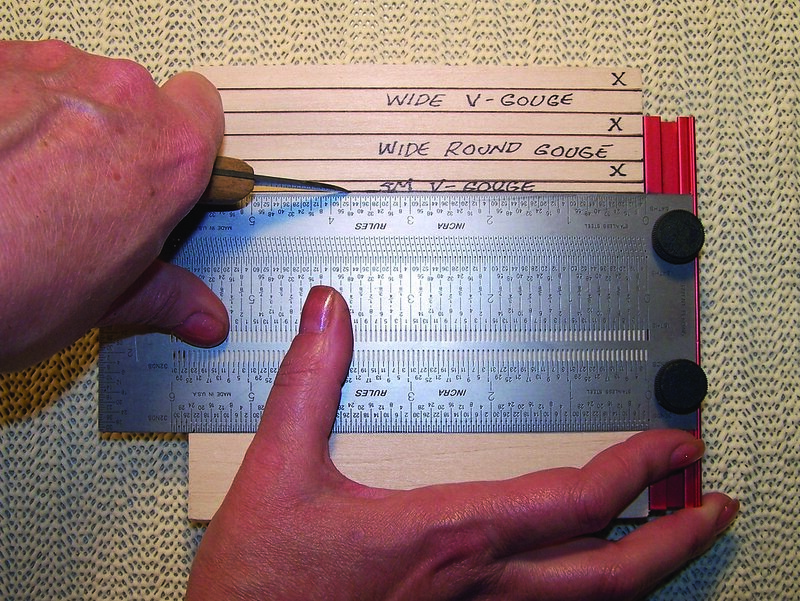 Use a metal ruler or T-square to extend your guidelines. 2. Make a stop cut along each guideline. Use a metal ruler and a bench knife. Your board will be divided down the middle. One section hones the bottom of your tools and is used with your tools face up. The second side hones the top side of your tools and is used with the tools face down. 3. Cut the reverse-profile side of your board first. 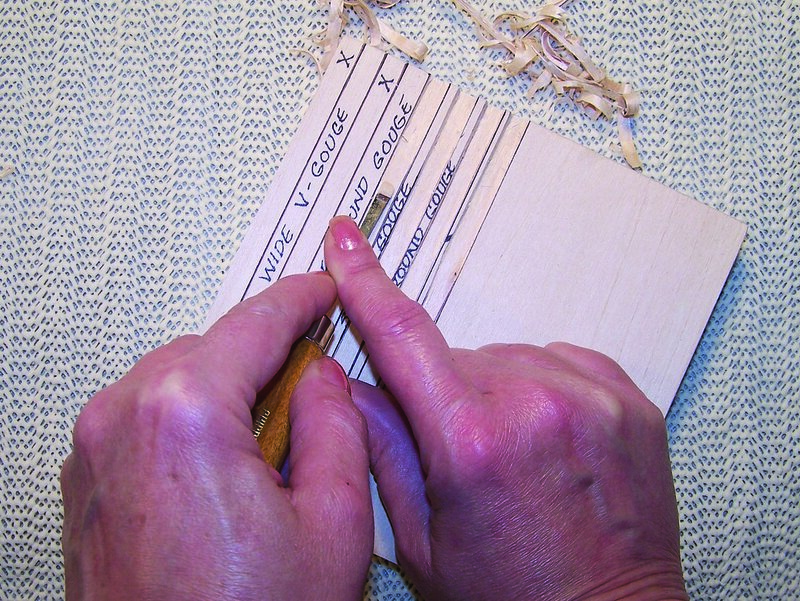 Use a straight chisel to remove the wood in the ¼” spaces and the side margin. Work from the centerline of your board towards one side. This will create a high, flat ridge for each of your gouges. 4. 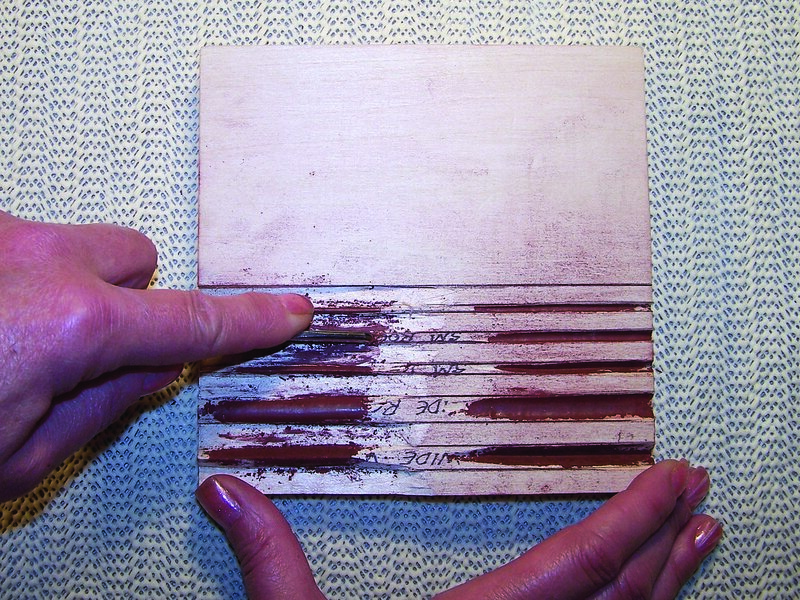 Taper these spaces from the center of the board to the outer edge. The depth of the spaces is determined by the sweep of your gouges. With a straight chisel, taper the sides of the high ridges just enough so that your gouge drops over the sides when placed face down on the ridge. 5. Place your gouge face down and begin cutting the ridge. Begin your work near the edge of the honing board. 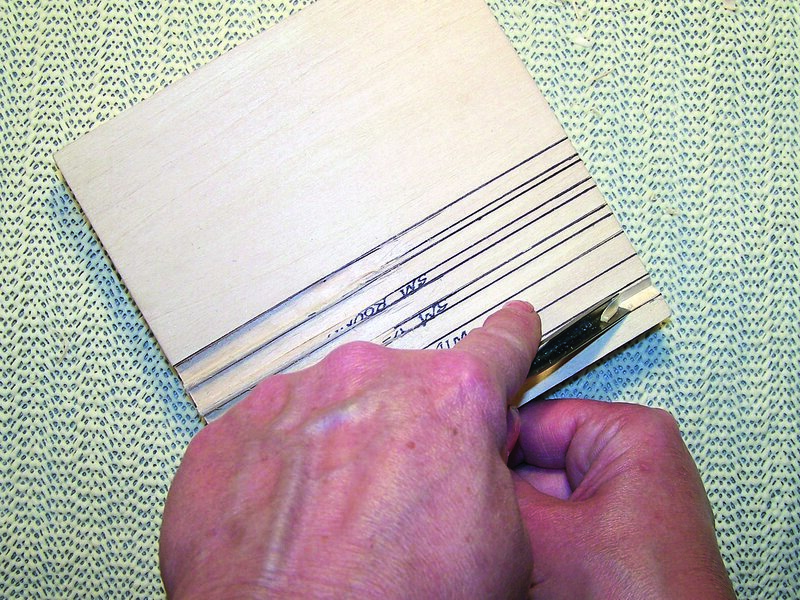 As you begin to develop the reverse profile cut, move your tool towards the center of the board. Keep the tool as flat to the honing board as possible. When your profile is completed, you should have a definite inverted “V” or “U” shape depending on the tool. Cut each reverse profile until the entire tool lies against the wood. 6. Shape the profile side of the honing board. 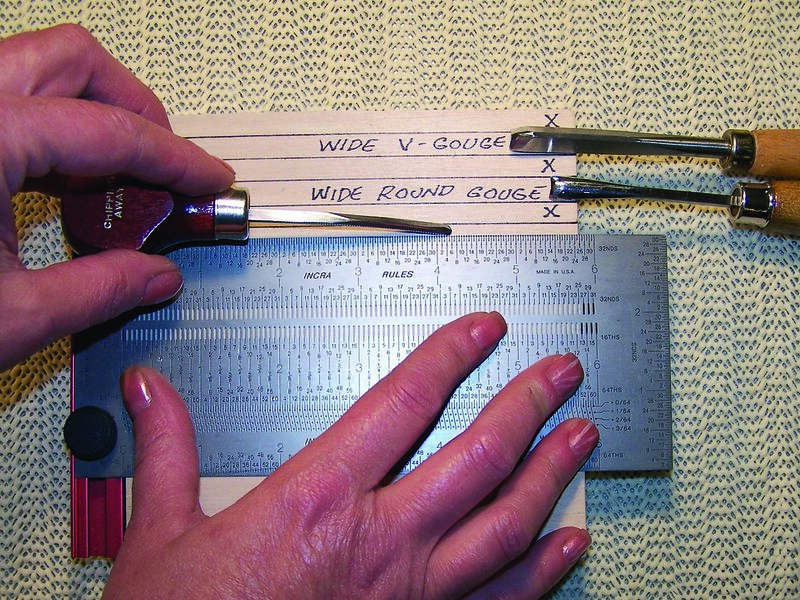 Notice that the spaces between the gouge guidelines have not been cut or removed. Working with your tools face up, cut between the guidelines with each gouge or V-tool. Start your cuts near the edge of the honing board, and with each cut, work back towards the center of your board. Work each profile cut until the entire tool drops into the cut area. 7. Choose your honing compound. There are a variety of honing compounds available. The top compound shown here is aluminum oxide, which is available in powder form. 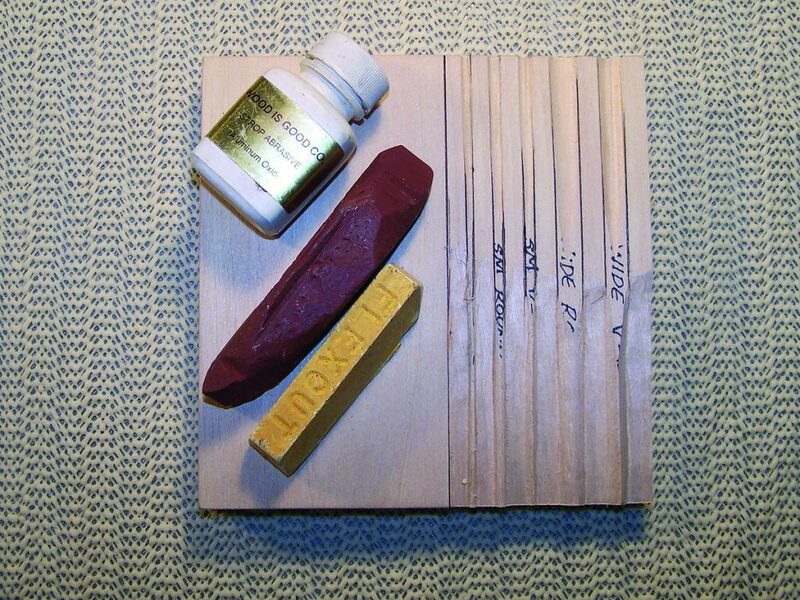 The red iron oxide and gold compound are shown in stick form. Red iron oxide compound in stick form contains a wax base that will help the abrasive adhere to your honing board’s profiles. 8. 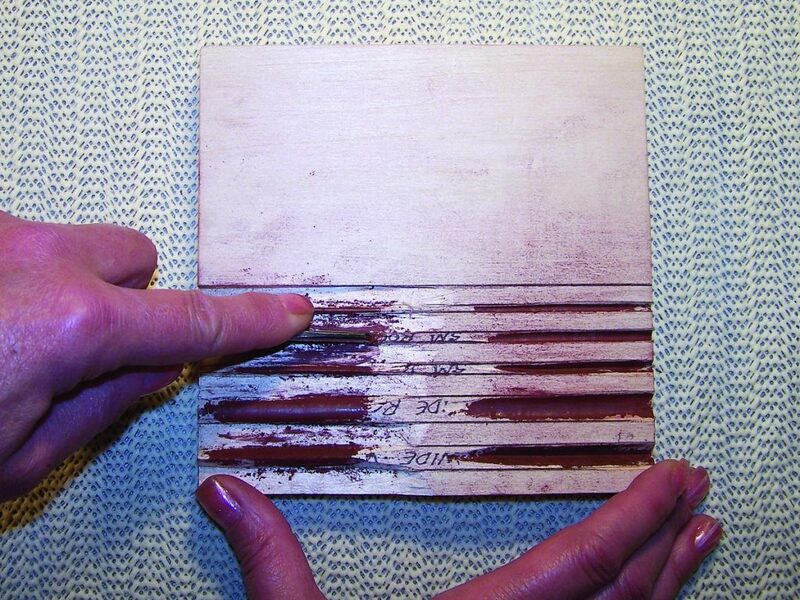 Shave a small amount of red iron oxide compound onto your honing board. Use a bench knife. Working the profile side first, push some of the rouge into the profile grooves. 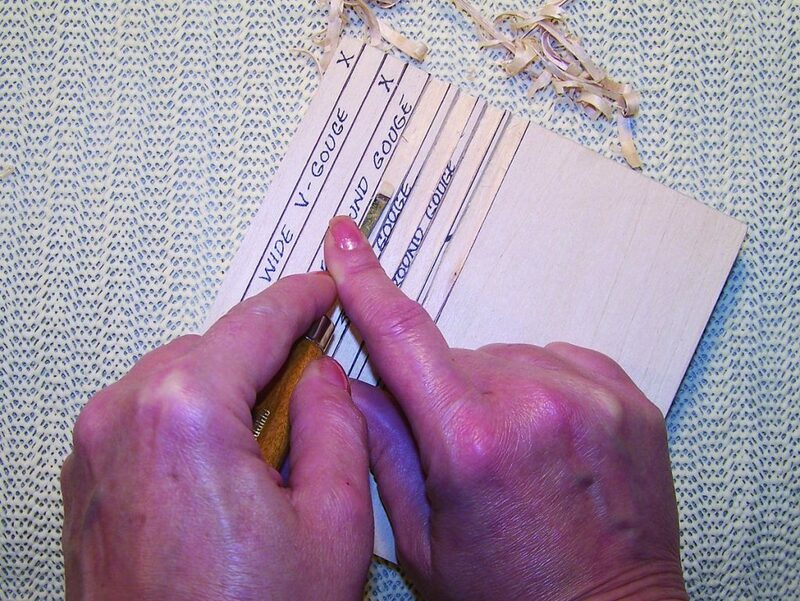 Now place your gouge over the abrasive, and pull the tool towards the edge of your board. This will pack the abrasive into the groove area. 9. Repeat the process for the reverse-profile side. Again, work the rouge onto the profile ridges from the center of the board towards the edge. Lora S. Irish is a nationally known artist and author. Visit her digital pattern warehouse—www.carvingpatterns.com. The website features free patterns and patterns for purchase.